Philanthropist and former talk show host Jenny Jones toured the recent Firehouse World exhibit hall in Los Angeles. 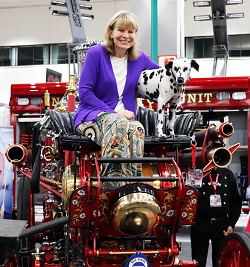 She is shown here atop the CSFA Steamer with Dottie, the Steamer Team's mascot. Through a partnership with CSFA and philanthropist and former talk show host Jenny Jones, $50,000 in grant funds are available to California's volunteer fire departments. Volunteer and combination paid/volunteer fire departments, may apply. Applicants may request from $1000 to $25,000. Funds may be used to purchase equipment (funds may not be used for payroll, benefits, department overhead or any membership). For more about Jenny's Heroes California and Jenny’s philanthropy follow this link. 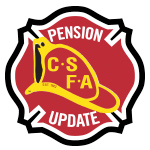 For any questions please call the CSFA office at 800-451-2732. 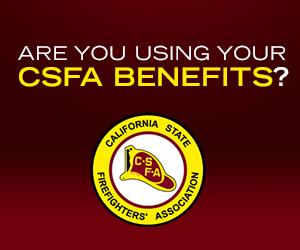 CSFA announces new insurance benefits! Code 3 Policy — Expect the unexpected! The call comes in as a structure fire. As personnel are suiting up, you fire up the rig and get the lights activated. In moments you're rolling Code 3 with the siren wailing, radio communication blaring, the captain relaying information to the crew. The car ahead of you stops abruptly in your path, but you manage to navigate around it. As you barrel toward the congested intersection, the light turns red. Off to the distance in your peripheral vision, you see a header. Your mind is racing with excitement and a bit of anxiety. Click here to read more stories like this. Designed for transfer students and aspiring professional leaders. What's stopping Utah's first responders from getting new radios? Two industry giants are fighting over the $50 million contract. MISSED AN ISSUE OF THE CSFA CONNECTION? VISIT AND SEARCH THE ARCHIVE TODAY. April 6 Sacramento River Cats Salute to First Responders, West Sacramento. For more information, click here. April 8-13 Fire Department Instructors Conference, Indianapolis. For more information, click here. April 29 CSFA Legislative Reception, Sacramento. To RSVP call 800-451-2732. 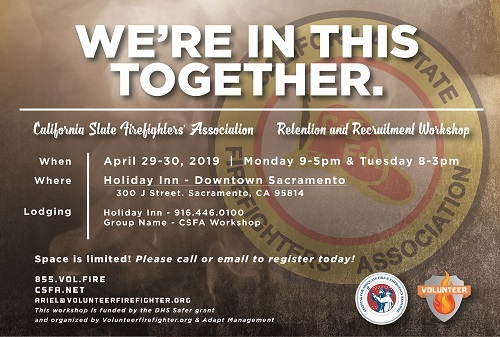 April 29-30 CSFA Retention and Recruitment Workshop, Sacramento. For more information click here. April 30 - May 3 Company Officer Assessment Center Help workshop, (C.O.A.C.H), Rancho Cucamonga. For more information, click here. May 2-3 Southern California Association of Foresters and Fire Wardens, 89th Annual Conference. For more information, click here. May 6-10 Rescue Systems II, Menlo Park Fire District. For more information, click here. May 30 - June 1 CERT and Listos Preparedness Conference, San Diego. For more information, click here. June 2-9 U.S. Police and Fire Championships, San Diego. For more information, click here. June 14-15 National Volunteer Fire Council, 5th annual Training Summit, Portland, Oregon. For more information, click here. Oct. 28-13 FireShowsWest, Reno. For more information, click here. Feb. 24-27, 2020 Firehouse Word 2020 For more information, click here. To have your event listed here, send details to ggiacomo@csfa.net.